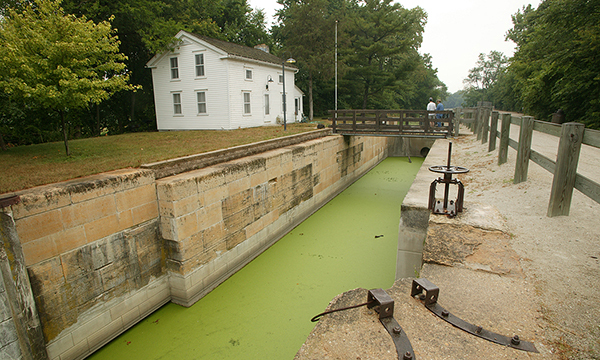 Channahon State Park is the official trailhead for the Illinois & Michigan Canal State Trail. Channahon is an Indian word meaning "the meeting of the waters" and signifies the joining of the DuPage, Des Plaines and Kankakee rivers. Today, Channahon State Park is under the management of the Illinois Department of Natural Resources and provides park visitors a look back at a historic waterway that transformed a state. Locks 6 & 7 and the original locktenders house at Lock 6 located at the Channahon State Park enable visitors to daydream of a time when one of the loudest noises heard came from a blacksmith pounding out a new set of horse shoes.